Ambience:80's Restraunt setup with Juke Box. 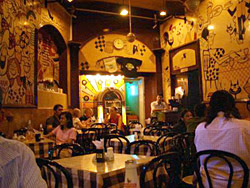 Cafe Mondegar is one of the Oldest Resto bar in Mumbai. Its Speciality is to serve Fresh Barrel beer.Cafe Mondegar attracts lots of Foreign Tourist because of its speciality of serving fresh beer.Apart from Beer the ambience and the setup of that bar is outstanding.the setup of the bar is like a Old Irani hotel and the Menu card is pasted on the entire table so that while sitting and chatting you can decide your menu. The best part what i like about cafe Mondegar is the Juke Box.you need to shell out Rs 10 in the juke box and it can play you the rock music sung in 80's which is priceless. There is no specific age group who visit cafe mondegar.As this cafe is also famuous for serving one of the best English breakfast in Mumbai yu will find people of all age group comming in and have a blast. Cafe Mondegar accepts all kind of payment i.e Cash,Credit card,US Dollars,Pounds,Euro's etc. Experience:Personally speaking i am a fan of Beer and having said that,I have been to lot of Pubs in Mumbai which has amazing ambience but when i go to Cafe mondegar the feeling is absolutely different because unlike all the other pubs,Cafe Mondegar do not have too loud and Indian remixes.It Only plays Soft rock which takes you to a different level.One more think what i like aboout Mondy's is the way they service beer.Only in Cafe Mondy's you will observe that they serve you Beer in Ice Chilled Glass since it helps the beer to stay cool.